The EUR/USD currency pair corrected its previous ascending movement, but couldn’t start a new one. The structure of the pattern implies that the price may grow up to reach the level of 1.3000 and then fall down towards the level of 1.2820. However, the market wasn’t able to form an ascending wave from the support level and may reach the next target below. Later, in our opinion, the pair may start a consolidation form this minimum. The form and the structure of this consolidation will help us to define the future scenario. 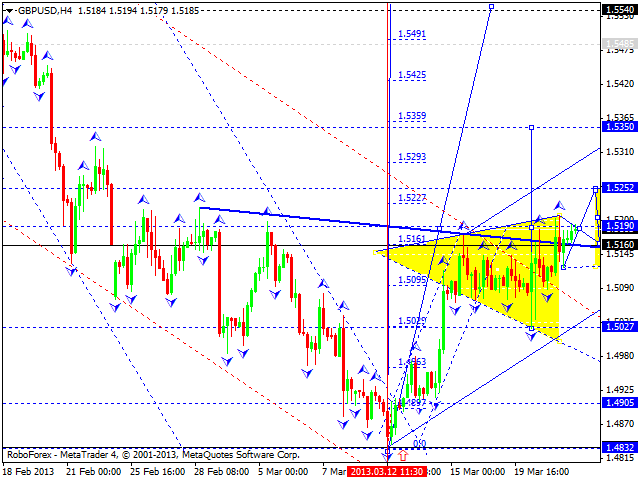 The GBP/USD currency pair is moving close to the level of 1.5190 and forming the third ascending wave. We think today the price may break the level of 1.5190 and form a consolidation channel near it. Later, in our opinion, the pair may grow up to reach a local target at 1.5350, return to the level of 1.5190 to test it from above, and then continue moving upwards. 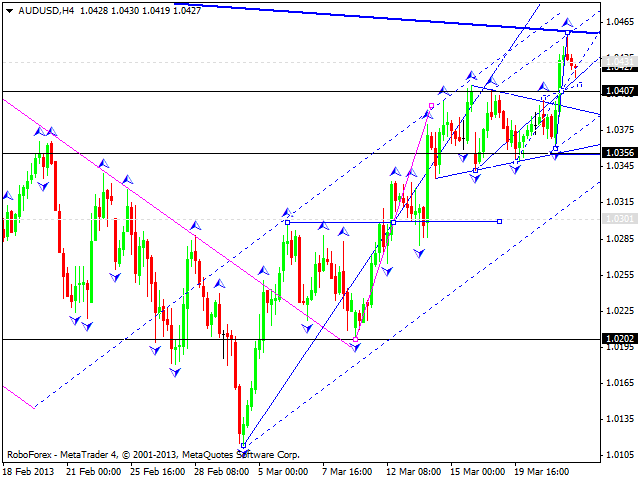 The USD/CHF currency pair stopped consolidating and started moving upwards. We think today the price may reach the level of 0.9500 and finish this ascending correction. Later, in our opinion, the pair may for a pivot point for a reverse. The next target is at the level of 0.9380. The USD/JPY currency pair is still being corrected; the current descending movement may be considered as the fifth wave of this correction. 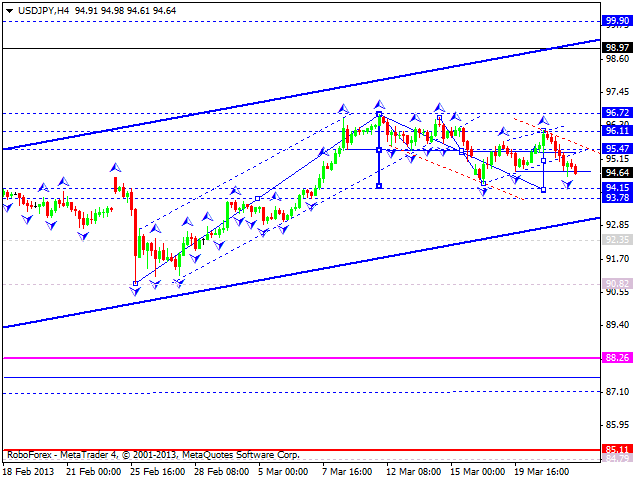 We think today the price may reach the level of 94.20 and then start a new ascending wave. The first target is to reach new maximums. Later, after a consolidation, in our opinion, the price may continue growing up towards the level of 99.90. 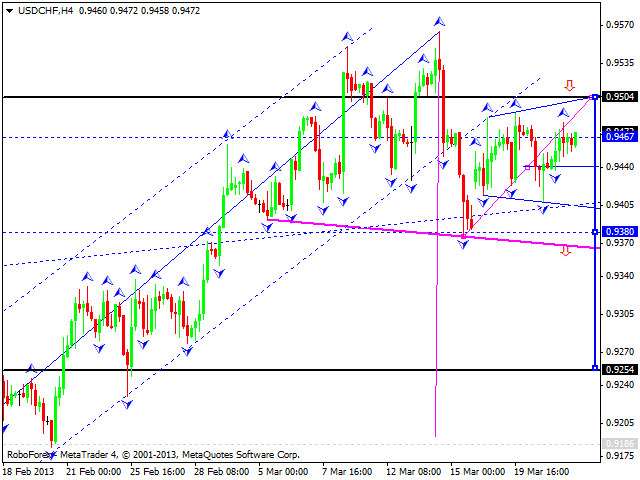 Australian Dollar broke its consolidation triangle pattern upwards. 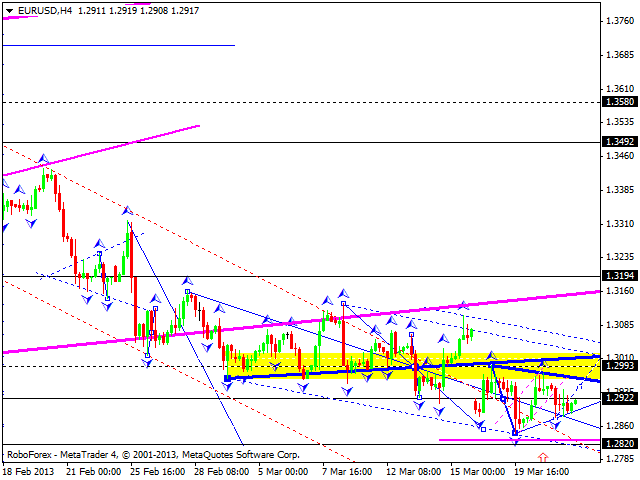 We think the price may continue growing up towards the main target of this correction at the level of 1.0480. Later, in our opinion, the pair may start forming a new descending wave to reach new minimums. 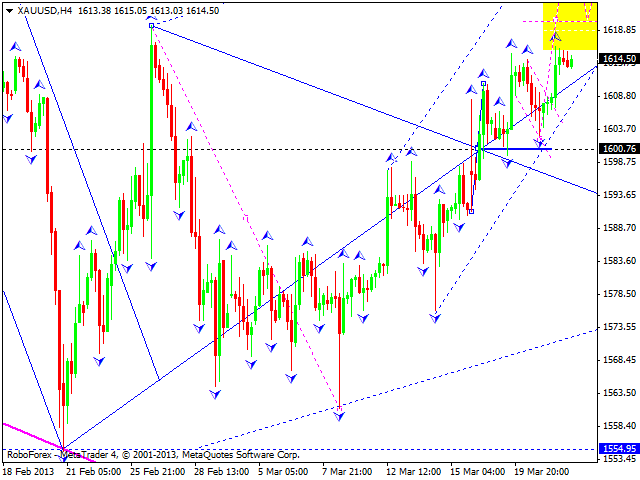 Gold continues forming the third ascending wave. We think today the instrument may continue growing up, reach the target at 1640, and then start a new descending structure to test the level of 1600 from above. This descending structure will define an exact target. Later, in our opinion, the price may start another ascending movement towards the main target of this correction at 1646.